Specially formulated soap made from saponified olea europaea (organic extra virgin olive oil), cocos nucifera (organic coconut oil), spring water, and essential oil. NO added glycerin, sweeteners, silicates (sand), fluoride, dyes, stabilizers or other materials that can damage teeth. Be sure to create an account while you are going through the checkout process. After paying for your order, go to your account area in our shopping cart for a downloadable file on how to have healthy teeth and gums. After using car was & wax on my teeth for years, I found DR Kim's tooth soap to be such a release. The old car was that I used had a very bad flavor but the mint in this tooth soap is a minor improvement. Every now and then my teeth are sensitive and I usually realize I haven't been flossing as usual. I use Dr. Kim's tooth soap and in a couple of days the sensitivity is gone. This tooth soap cleans my teeth exceptionally well, I wish it tasted better but that's a minor thing for me. I feel good knowing there's nothing in this I wouldn't want to put in my mouth. Have been using Peelu for years and thought I was quite happy. Since Dr. Kim tries all his products on his family first, the trial and error is eliminated for me. First brushing my teeth were whiter. I know this is not a claim just an added benefit. On another note I do oil pulling and have used an electric toothbrush for over 10 years. Will never go back to a manual brush. When you open the jar, it is full of soft pale yellow shreds of tooth soap. The directions say to remove one shred, place between your back molars, and bite down. Then brush with wet toothbrush and rinse as desired. It appeared that most shreds were about 1.25 in long, plus or minus. I took one shred out of the jar with a tweezer, so I wouldn't dirty or disturb the whole bunch by getting my fingers in there, but you could use your fingers too. A light spearmint scent was evident on opening the jar. 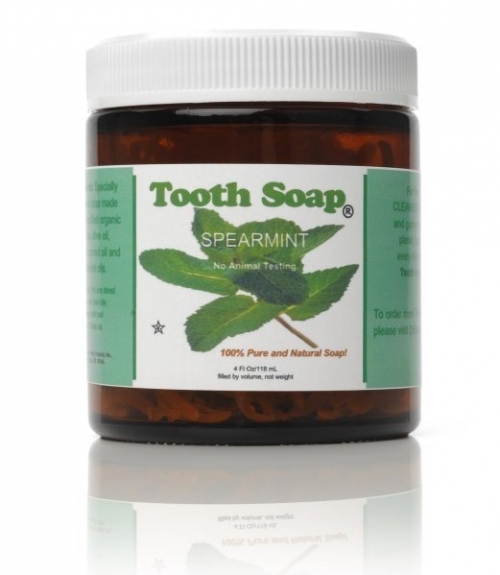 The spearmint taste with brushing is very mild. My teeth felt clean, but it was not the popping freshness that I was used to with conventional mint flavored toothpaste. I can give that up to have better health. Tooth soap uses an essential oil, rather than some unnamed "flavoring," listed on my conventional paste. That all being said, you can't beat it having only 3 wholesome, healthy, ingredients (that can be pronounced) Maybe a hint of soap taste, but definitely nothing even close to the sharpness, harshness, or bitterness of soap at all. Very mild. Small amount of sudsing in mouth. I may add a little baking soda to my brushing from time to time to help with food stains. Definitely read the "Overview," button under the product above, to read an article that further explores this idea of tooth soap. I am definitely going to give this product a serious try. It is an ample amount that should last quite awhile. Wonder how the citrus flavor tastes, but it is not offered on this site. My teeth feel very clean all day long. This jar is equivalent to 4 standard tubes of toothpaste. Excellent product/value! I had suffered from an extremely sensitive tooth with an exposed root for several years; it was most painful when sugary substances came into contact with that tooth. I had tried several things suggested by my dentist to no avail. After only 3 days of using Dr. Kim's tooth soap, I could notice the sensitivity in my tooth decreasing. Now it is gone and only rarely makes a slight appearance. And my teeth feel much cleaner throughout the day and night. I trusted the five star reviews. my gums started to peel out.I took it for two days with salt water , to make my gums calm down.It made my teeth very sensitive now. I had to get used to the taste, a bit. But my teeth are clean, the rough bits behind my front teeth have vanished without having the dentist pick at them, and I know I'm not getting fluoride, triclosan, or other poisons in my mouth several times a day. Great product. I have a really sensitive mouth, and have been searching for a "tooth paste" for a long time that would work for me. Many different brands work temporarily, but then my mouth gets too sensitive. Thank goodness for Dr. Ben Kim's "tooth soap". It is a great product - even for the sensitive teeth, mouth, and gums. I would highly recommend it to anyone - and the supply lasts a very long time! OK....let me first say that the flavor is not that great. Buuutttt, its 100% natural and it makes splendid lather! Also, my teeth feel soooo clean! My 3 year old loves to use it too! He says to me : Mom, give me a little worm to clean my teeth!! hahaha. I enjoy Dr Ben Kim's health articles, and buy his products, but I have to draw the line at tooth soap. I can't say for this brand, but another brand I bought from another health site tasted like - well, SOAP. Why would anyone choose the punishment of washing their own mouth out with soap? There must be alternatives that are as effective and health-promoting, but taste better, don't ya think?